According to Percy Shook, "About a month or two after we came ashore I was coming to breakfast. I came upon four Japanese soldiers sitting in front of our squadron headquarters smoking cigarettes. They turned themselves in from hiding in the many caves on our side of the island. They probably ran out of food." 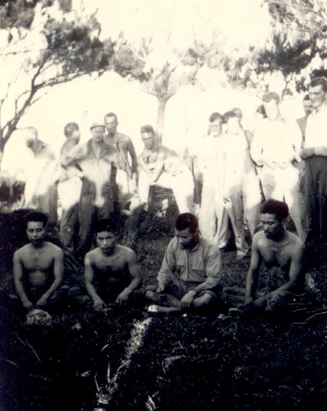 Bert Collison recalled two Japanese soldiers showing up at breakfast in the mess tent saying they had been hiding in caves on the island. Bert says the Japanese soldiers ate well that morning.